Cinénova Grande 7 BR - Earthquake Sound Corp.
Cinénova Grande’s oversized construction ensures easy, accurate and articulate reproduction of any source material. The special high-speed transistors were developed by Earthquake in collaboration with Toshiba. Cinénova Grande’s ability to control a large and heavy sub-woofer cone is unmatched even when compared to exotic 2 channel designs. A damping factor of more than 1,600 means that even large and heavy speakers are dominated with ease. Even the most complex low frequency material is reproduced with dynamic punch and rock-hard control. Cinénova Grande is equipped with a monstrous 4000VA toroidal transformer. Besides its vast mass, there are several things that distinguish it from other audio transformers. It is based on a core of pure ferrite giving the transformer a very high power density and stiffness compared to typical iron cores. The transformer is wound of 99.99% oxygen free copper of 12 gauge thickness. The use of oxygen-free copper as winding material increases the transformer's efficiency and stiffness significantly. The combination of a core of pure ferrite and windings of oxygen free copper elevates transformer power efficiency. This means that only a fraction of flow-through current is converted into heat. The transformer is further unique in its bi-file structure. Bi-File means that each power amplifier module block has its own secondary winding. It isolates the individual module blocks and makes them independent from each other’s power supply. At the same time making every module blocks secondary winding magnetically coupled to the one large primary winding. This results in a supply stability and stiffness unknown in amplifiers based on several small transformers. The above specified design results in a power supply with a regulation factor of less than 3% at full power. Our engineers are very environmentally conscious and from Cinénova Grandes conception, environmental awareness and efficiency were absolutely essential. It is by nature a necessity to put power into the amplifier in order to get power out of the amplifier. A combination of innovative technologies and precise tuning and calibration led to Cinénova Grande being the market leader in Green Power. 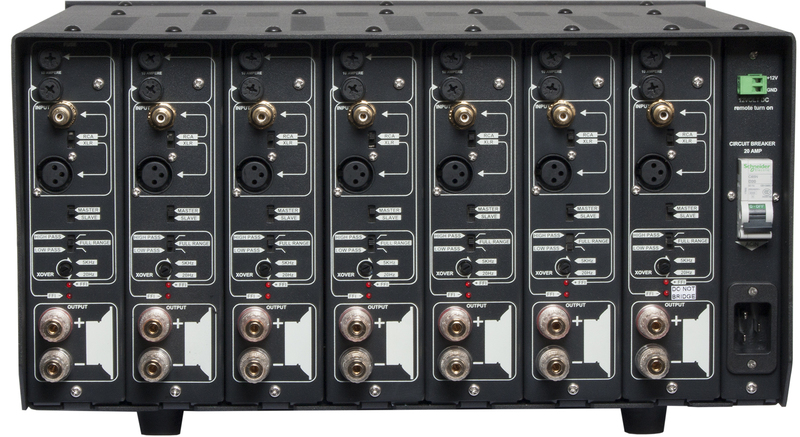 A five-channel Cinénova Grande with a total power capacity of 5000 watts continuous has an idle consumption of only 0.25 amps (230 volt). This corresponds to the consumption of a typical fish tank, found in many homes. By comparison, there are other brands of power amplifiers with an idle consumption of over 2 amps, which corresponds to a strong halogen lamp or a small vacuum cleaner. Cinénova Grande is proof that good sound quality can no longer be used as an excuse for excess power consumption. This built-in technology makes Cinénova Grande unaffected by noise from the power grid. This ensures that DC content in the mains is not dissipated as heat and hum in the amplifier's main transformer. Many have probably seen how the activation of a refrigerator compressor can be heard throughout the speakers and how electronic transformers in halogen lights can create noise on the power grid. These noise sources have no influence on Cinénova Grande’s performance. The exclusive power conditioner eliminates the need for expensive external power conditioners and related accessories. By exclusively using mil-spec FR-4 printed circuit boards in the Cinénova Grande, problems with "cold" solder joints and PCB warping due to thermal effects or other environmental factors were eliminated. Cinénova Grande is built with understanding and acute awareness of how essential the cooling system is to both the amplifier's performance and durability. A well designed and properly sized cooling system is at least as expensive to produce as an exotic output stage or an extravagantly large transformer. However, it is extremely rare that an amplifier’s cooling system is highlighted in the product literature, as it is not considered to have marketing appeal. In the Cinénova Grande the heat sink is designed so that it exploits the amplifier's full height of 23 cm. This means that heat sink is vertically grooved and extends from the inlet port at the bottom of the amplifier to output openings at the top. This unobstructed chimney design means that air can freely move from bottom to top inside the amplifier and be accelerated unhindered by the natural convection. Just the height of the heat sinks makes the air flow increase exponentially as the air velocity increases for each centimeter of vertical ascending convection. The same heat sink surface area with half the height would have a greatly reduced cooling capacity. The Cinenova will keep cool even with the hardest and most rigorous use. This is a unique feature that allows each channel to be adjusted only to reproduce the user’s desired frequency range. A three-way switch and a potentiometer controls the filter function. If the switch is set to bypass, the crossover is disconnected and has no function and the channel acts as an ordinary mono output channel. If the switch is set to high pass, the channel will only reproduce the higher frequency range. The intersection of the crossover divider can be infinitely adjusted using the potentiometer. When the switch is set to low pass, it will only reproduce the lower frequency area and the intersection is adjusted in the same manner. Crossover function can be a superb tool for the enthusiastic DIYer, who wants to experiment with parts frequencies. Another area where Cinénova Grande differs from other amplifiers is its ability to protect itself against even the most extreme circumstances. It is not just technical protection, but protection with detailed instrumentation. Diagnosis of the amplifier's operating condition is a simple visual task. Cinénova Grande’s transformer is constantly monitored by a thermal monitoring system. Alpha One is equipped with a 15 amperes local main relay which disconnects the individual module block if it consumes more than 3450 watts. Besides the 15 amperes local main relay, Alpha One is equipped with 2 pcs. 10 amperes fuses which monitors the supply voltage - one for the positive and negative supply rail. 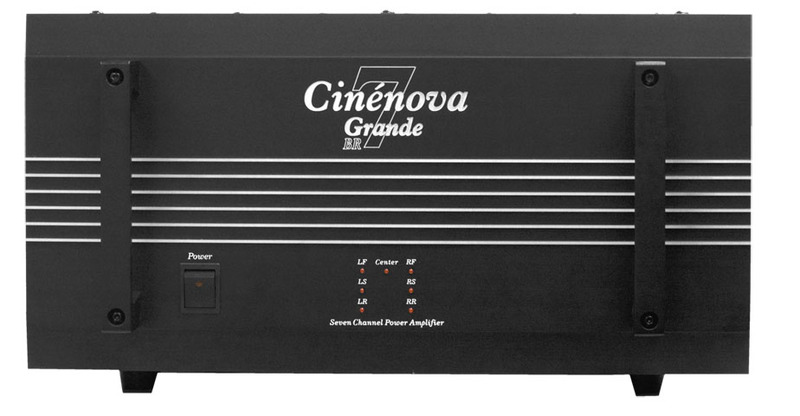 Cinénova Grande is additionally equipped with a 25 amperes global main relay. Cinénova Grande is protected against short circuit, transistor burning and other internal errors (open circuit). Besides protecting themselves, Cinénova Grande secures against forwarding DC to the speakers, and on / off transient protection (ensuring that the amplifier is not making loud noise in the speakers at start up). Cinénova Grande is able to accept both balanced XLR connections and general unbalanced RCA signals. Its implementation in Cinénova Grande separates it from other manufacturers. Traditionally, RCA and XLR inputs are mounted parallel to the same signal path and both inputs are active all the time. That means using the XLR inputs the RCA input acts as a small outdoor antenna and adds noise to the signal path. Cinénova Grande has a switch which disconnects the unused input. This ensures a closed signal path free from extraneous noise which is essential for a true balanced design to operate optimally. We hope that the above introduction to the Cinénova Grande’s universe has inspired you. It is our belief that Cinénova Grande is one of the world's best power amplifiers, regardless of price.